Peter Piper may have picked a peck of pickled peppers, but I’m picking purple petals from my perfect garden. It’s a purple palooza. Ha! Say that three times. The small corner garden near the walkway to our door looks like royalty. It’s awash in three shades of purple, with dots of orange and green accents. 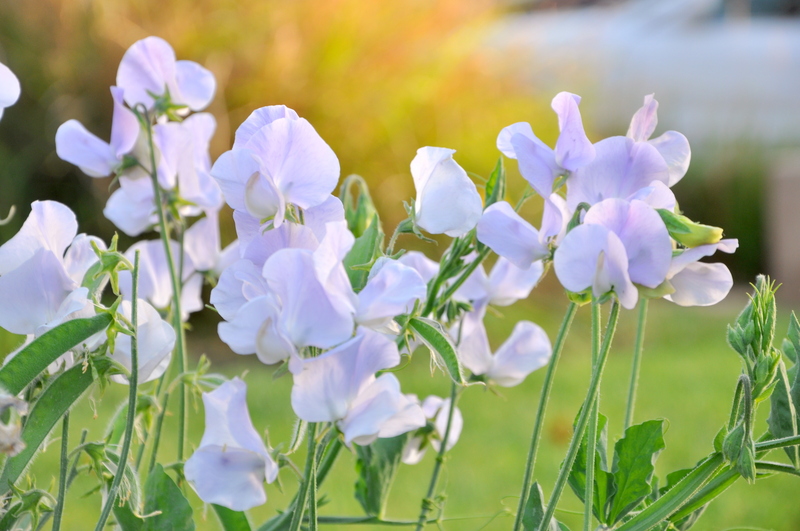 Last year’s sweet peas re-seeded and came back in a royal flush. They’re in good company too. 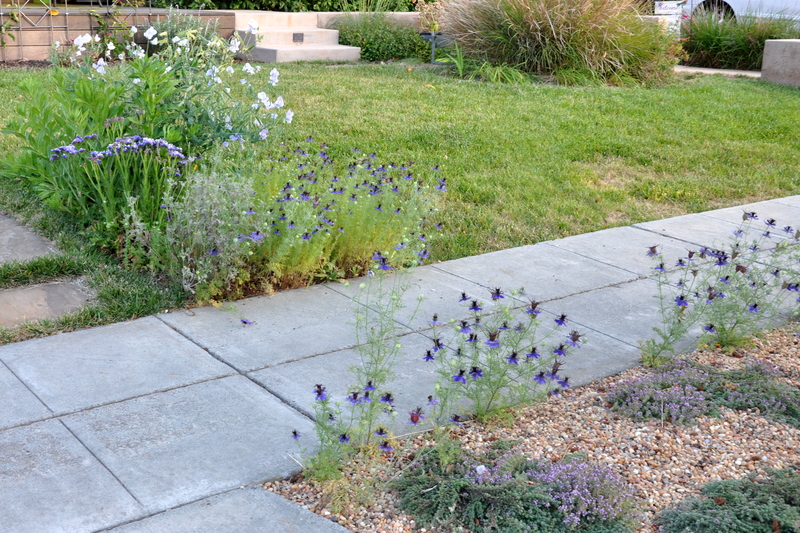 Love-in-a-Mist scattered seeds everywhere and now lines the sidewalk in a purple haze. Pay no attention to the dying grass in the background. The lawn is on its way out. The Statice flowered early this year, showing pearly white blooms in the center of the calyx. I love the way they compliment each other. 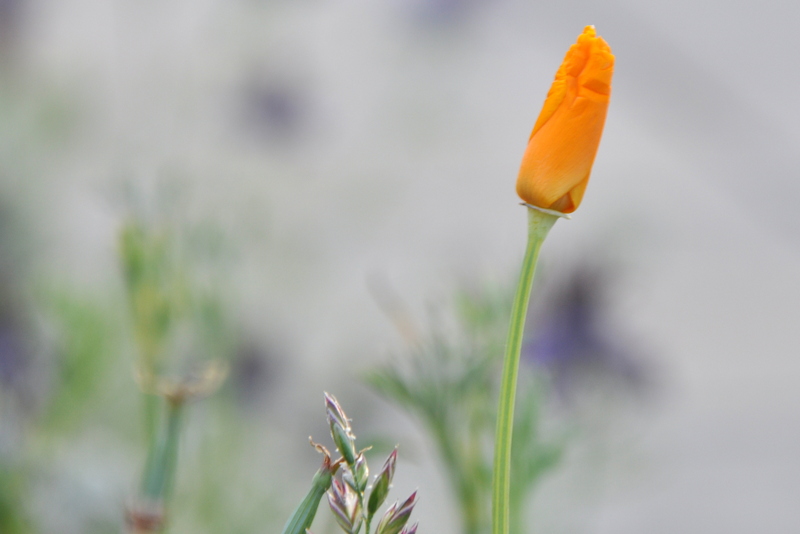 One California poppy grows at the edge, but I fear a dog is lifting its leg once a day as the foliage is looking a bit…tired. The plant is still hanging in there though. Go Team Violet! Go state flower! 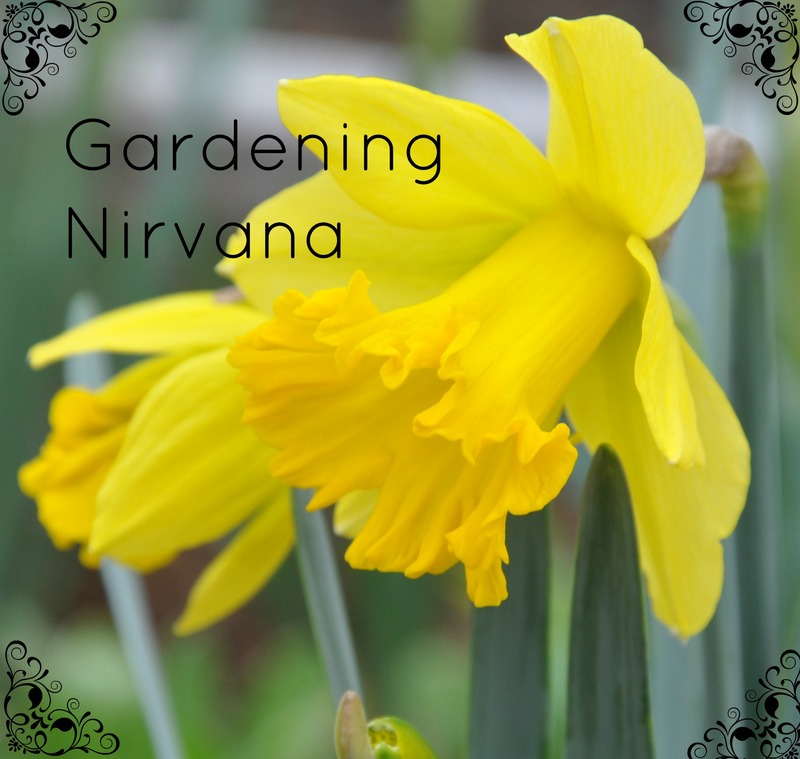 Gardening brings about a unique contentment: The work is satisfying, the results are rewarding, and the time spent with my face towards the earth grounds me like nothing else. We had a nice breeze today, keeping the temperatures manageable. Once finished with my appointments for the day, I spent ‘drop-in’ garden time at the curb. I love working the curb garden. I can take care of the entire box in about an hour, then continue to enjoy the fruits of my labor from my kitchen window. 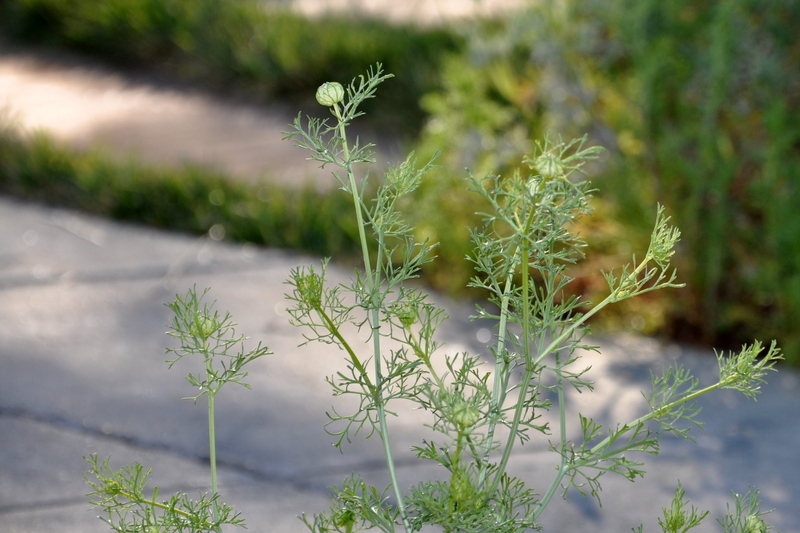 Love in a mist volunteering around the edges. Wooly thyme slowly filling in over the gravel. 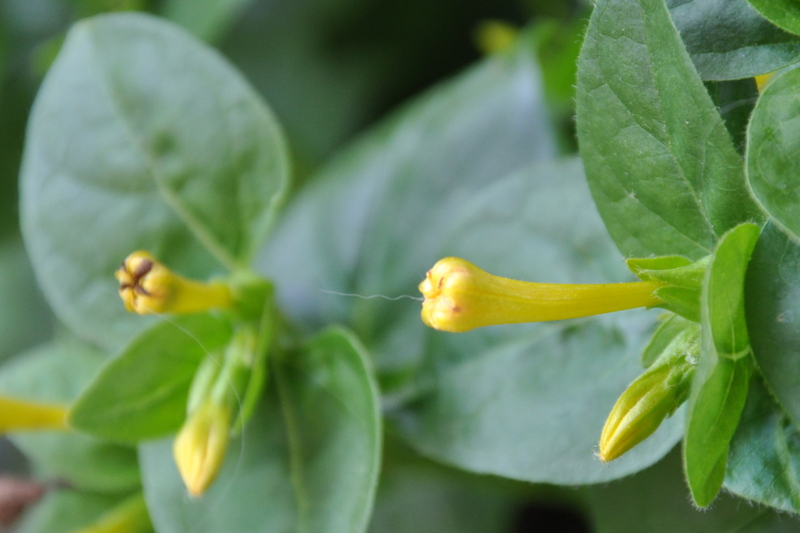 Can you spot the visitor on this yellow flower? The last of the daffodil foliage looked tired and spent, so I trimmed the bunches down to a few inches and tidied up the rest of the bed. 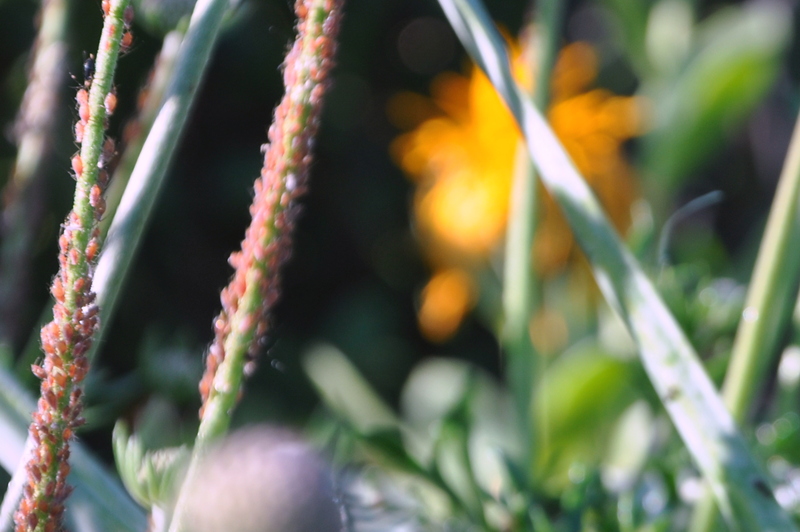 I spotted one or two lady bugs visiting the aphids. The ‘ladies in red’ generally consume a lot of aphids in one sitting, but they are currently outnumbered. I snipped off a few of the heavily infested branches and hope the ladybugs will tell their friends to return at dusk and take care of the rest. My son pointed out a small wasp’s nest inside the hollow ceramic bird perched in the center of the garden. The ‘bird’ used to be part of a ‘self watering’ system but it broke off at the base. I put it at the top of the small trellis over the winter for a bit of color. Since wasps eat garden pests too, I’m going to leave the nest undisturbed. I know many people have aggressive wasps that chase them around the garden, but the ones that nest near our house are fairly mellow. Case in point: I lifted the ceramic bird, spotted the nest and one adult who simply hovered nearby till I replaced her nest. I guess she’s content too. Did you find contentment today? 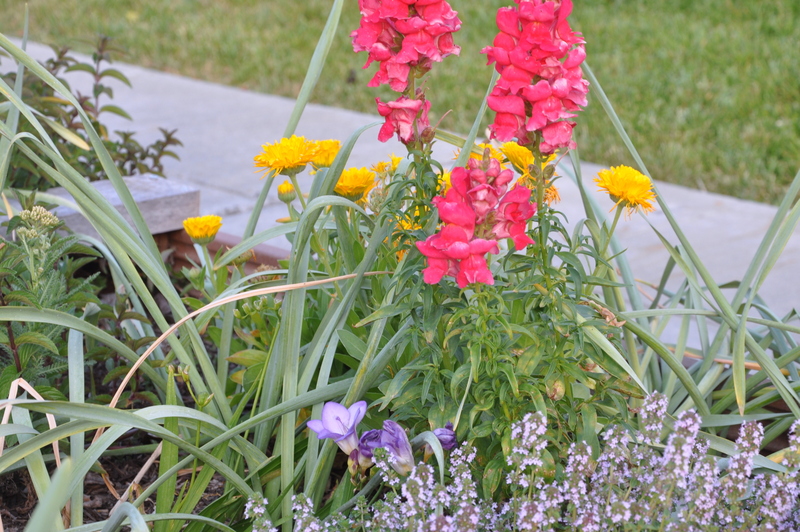 Have you ever planted one of those seed assortments that promise extraordinary results with no effort? 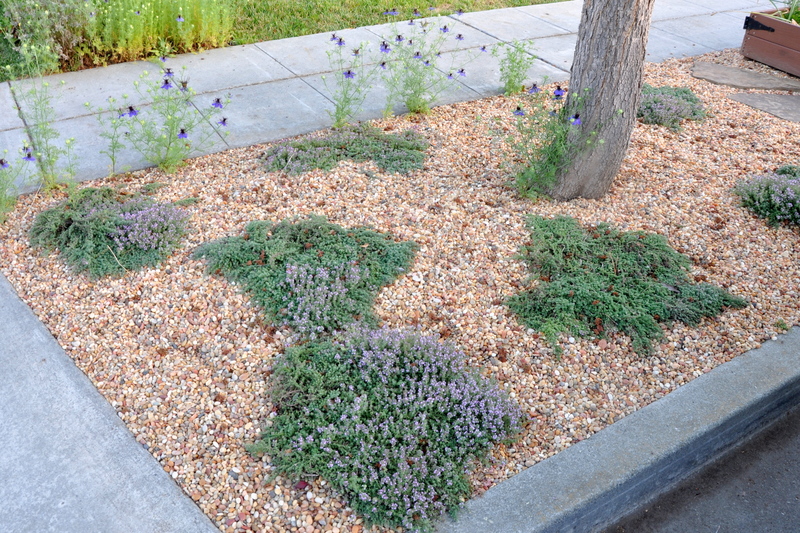 According to the package, a jaw-dropping butterfly garden will appear within a matter of weeks. All you have to do is scatter the seeds in the soil, cover, water and enjoy. I’ve fallen for the sales pitch twice now and I should know better. 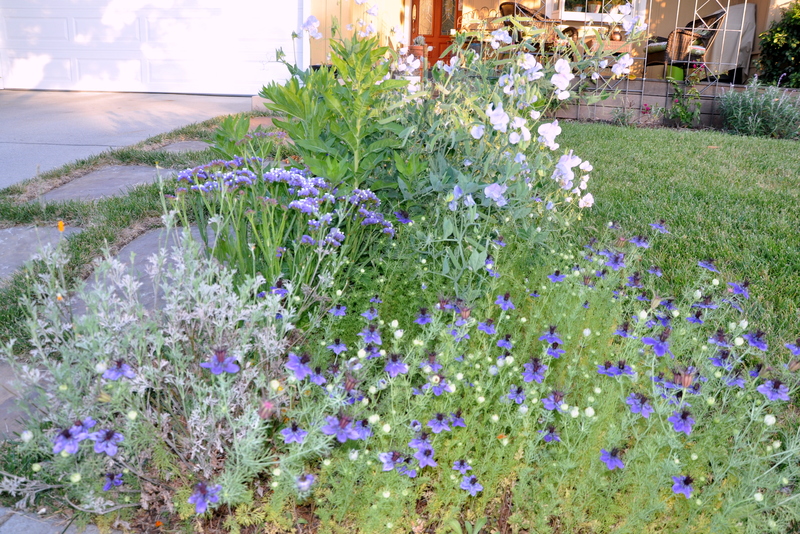 It seems irresistible when you see the photo on the packet with 100 square feet (30 meters) of wildflowers. 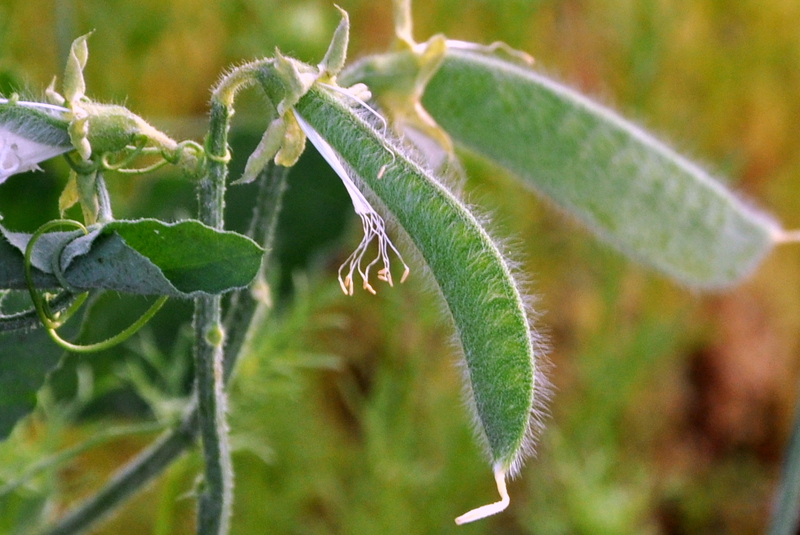 In my experience, ‘thousands of seeds’ turn out to be one, maybe two hardy plants. The end. I present to you, garden sprawl. 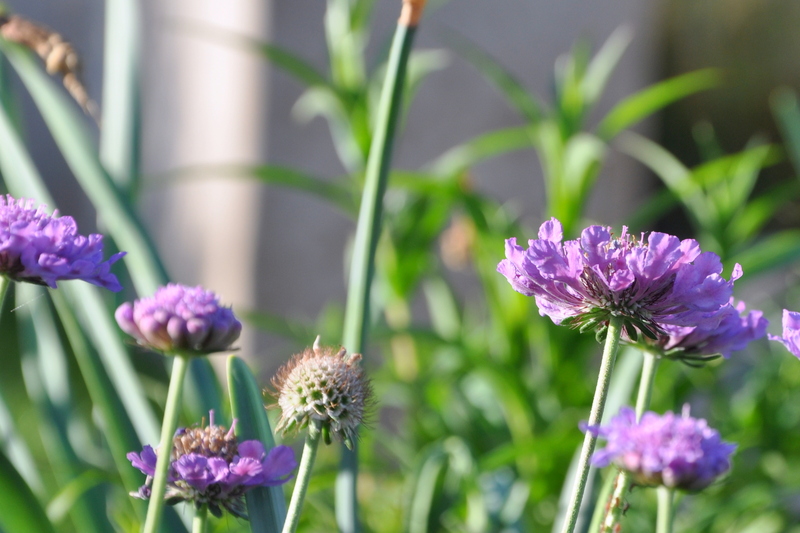 have sown themselves throughout the garden. They’ve traveled from the front to the back of the house, filling in the spaces in between. I even saw a few in the neighborhood on our evening walk. Those seeds get around! 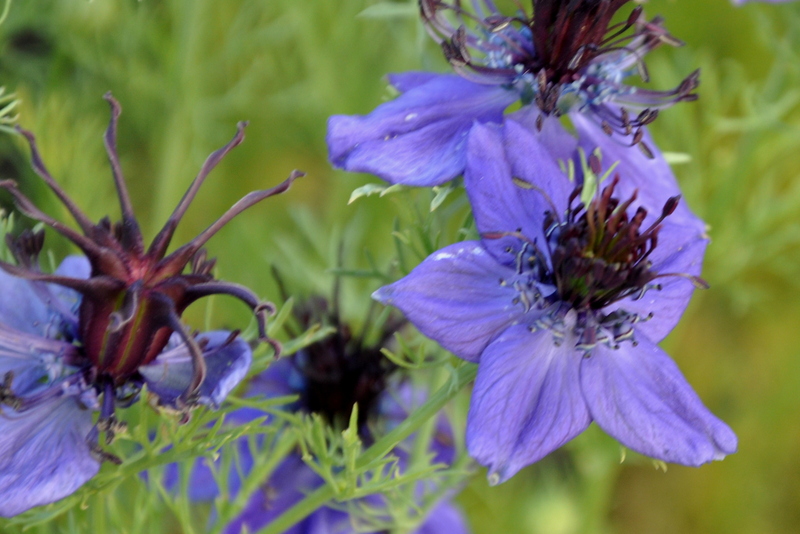 They’re all welcome in my garden, with their tender greens, pops of yellow and soon, love-in-a-mist lavender blooms. We’re on strict water restrictions as we work our way through year four of the drought. So far, the seedlings are getting by on morning dew and an occasional watering. 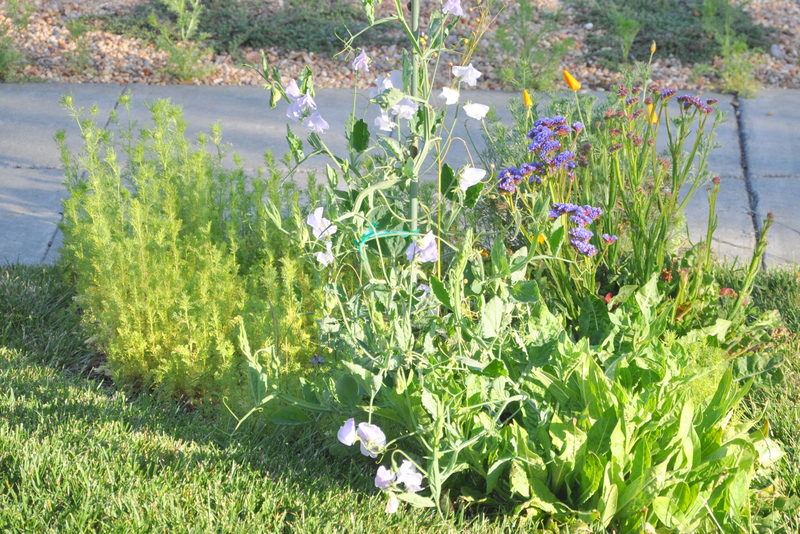 We’re turning off the sprinklers to the lawn completely and hope to eventually replace lawn with a native alternative. Meanwhile, I’m enjoying these unexpected gifts and their presence in my arid garden. What’s the water situation in your neck of the woods? I’ve been puttering in the garden here and there over the past week, but I still haven’t put together a plan for the summer. I pruned a hedge and pulled a few weeds but my busy schedule hasn’t allowed for much more. As we enter year four of our drought, water restrictions are increasing. 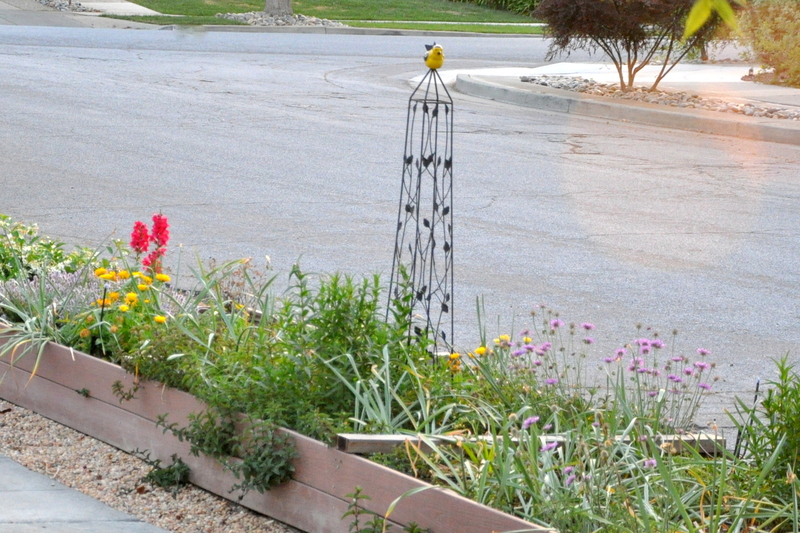 According to the state water agency, 44% of residential water use is outdoors. We’re now restricted to watering once every three days, using the odd/even method based on home address, and we can only water before 6 am or after 6 pm. I’ve left both vegetable beds empty for now. My original plan was to leave one box empty and plant some tomatoes and basil in the other. I love fresh tomatoes and basil and know that we’ll eat them all summer long. 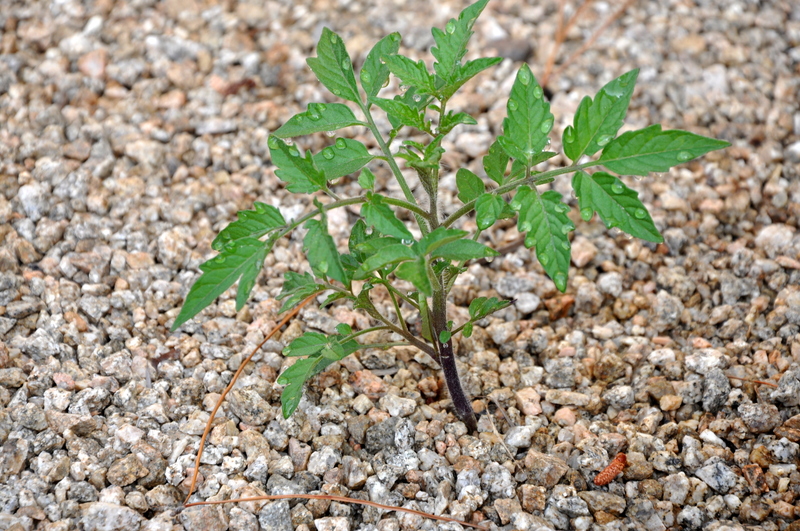 The tomatoes, however, have sprouted all over the garden, self-planting like they did last year. Instead of moving the plants, we’re going to add drip irrigation to the viable plants and see how it goes. 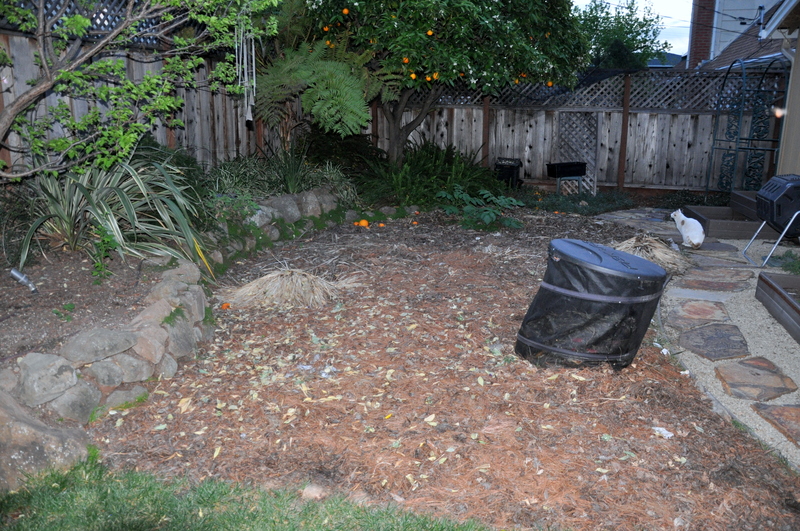 Last fall I sheet-mulched one half of the lawn, but the process is still ongoing. The grass died off as planned and much of the material is decomposing, but with so little rain, it’s taking longer than planned for it all to decompose. It’s not very pretty, is it? 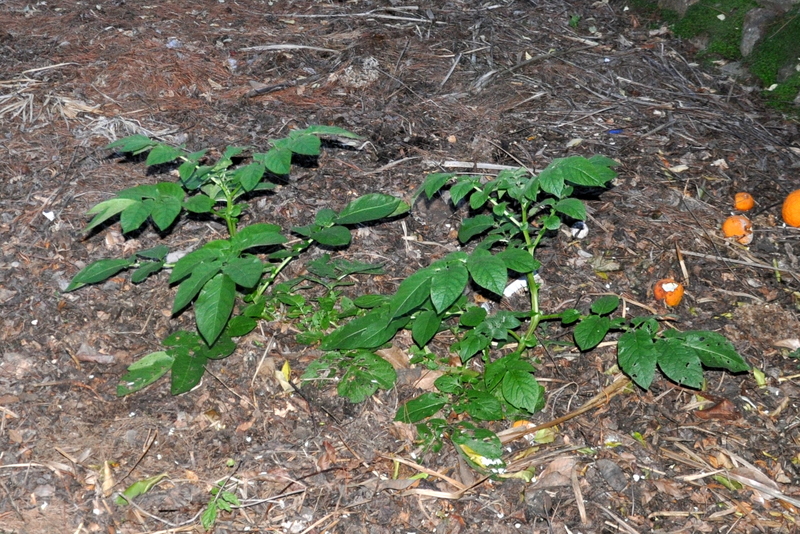 Comically, I have a pair of potato plants growing in the midst of the sheet mulch. It will be interesting to see if the plant flowers since it’s in the shade most of the day. 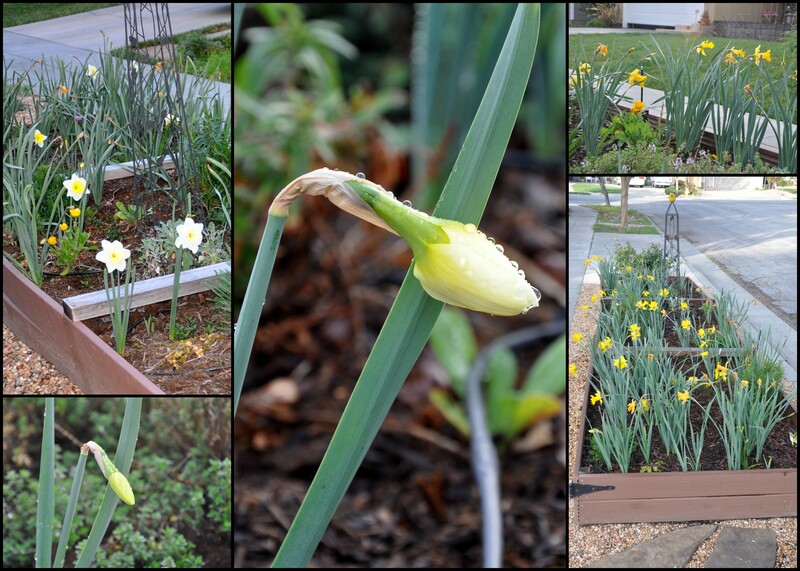 As the bright yellow daffodils begin to fade, a second group of plantings are taking their place. They’re two-toned and a bit shorter, but just as lovely. 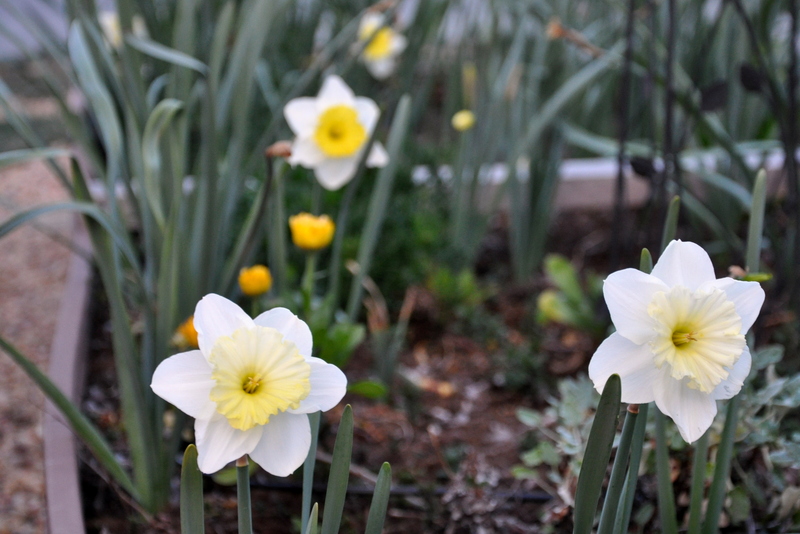 I’ve had great success with bulbs once I figured out what the squirrels don’t like, namely narcissus (daffodils), and hyacinth. We had a bit of rain overnight, and woke to a refreshed garden. That was a wonderful surprise. I only wish I hadn’t slept through it. Blogging 101: Branding Your Image? Today’s blogging 101 task asks us to extend our brand with one of the following: a custom Blavatar, a custom image widget, or a fan page. 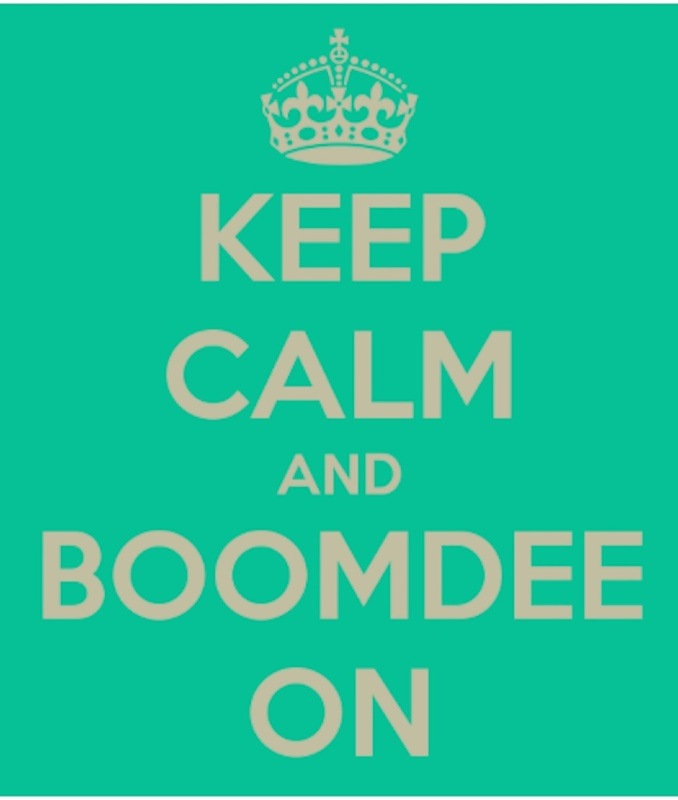 Since I already have a Gravatar and lacked the energy to create another Facebook page, I opted for the image widget. It was fun playing round with my photo using a (mostly) free app called PicMonkey, but the idea of creating a brand is a bit lost on me. You can see the image widget on the right side of my blog. Of all the lessons over the past few weeks, this was the most challenging, mostly because I just couldn’t see the point. 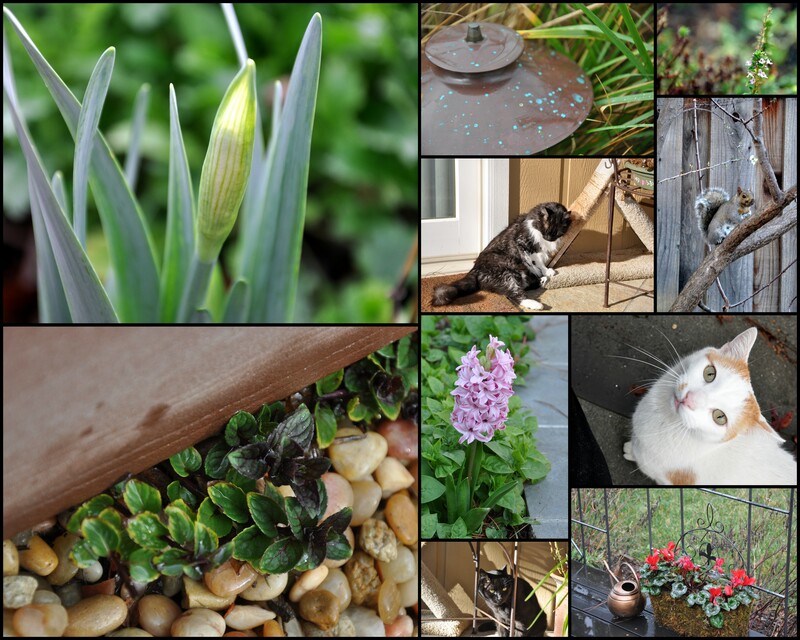 Have you used the image widget on your blog? How about PicMonkey? 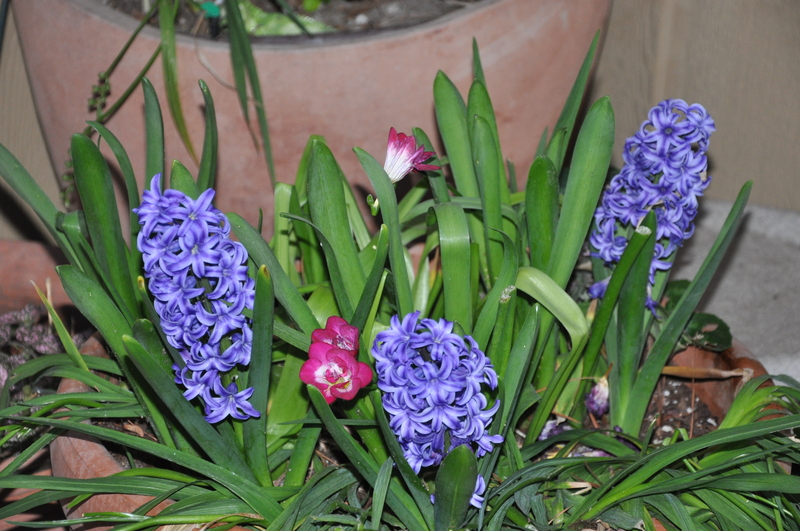 According to Aristotle, “Nature abhors a vacuum.” This small corner of my garden agrees. Then the usual suspects blow into town and make a mockery of it all. With some assist from the wind, a few birds and other garden foragers, this perfect little gem of a corner came together without any help from the gardener (that’s me). None of these plants are garden strangers. They enjoyed their stay last season and decided to make a come back. Below my window, and along the patio’s edge, a sampler garden is born. 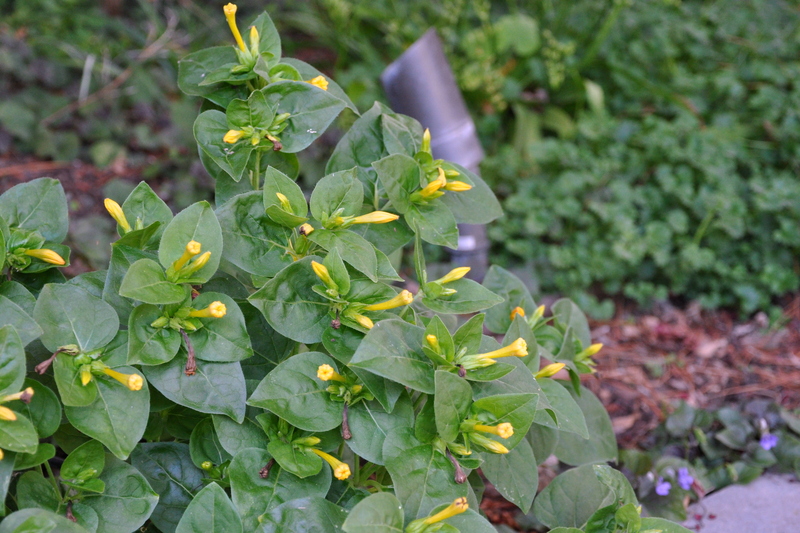 This prolific annual grows quickly with a low, sprawling habit. 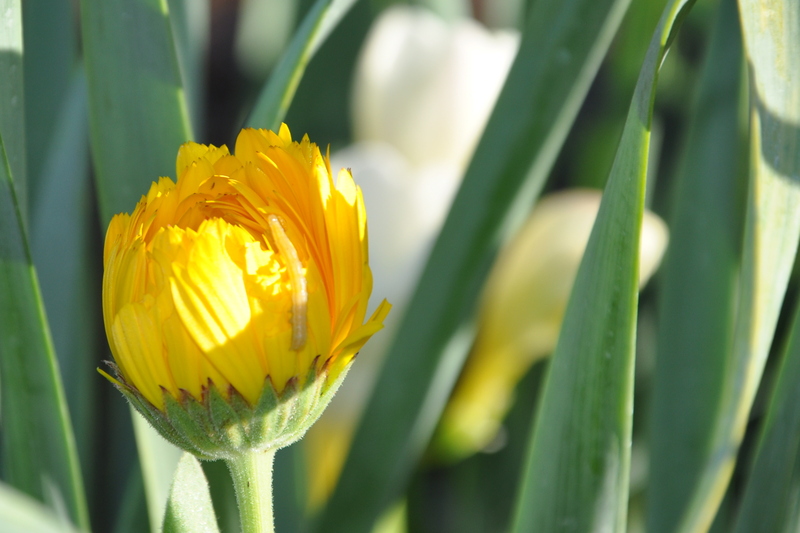 The original plant grew at the front of the house in the Children’s Garden, producing lovely yellow blooms around four o’clock each day, hence the name. I saved lots of seeds, but honestly, I needn’t have bothered. Two months ago, several seedlings started to grow. 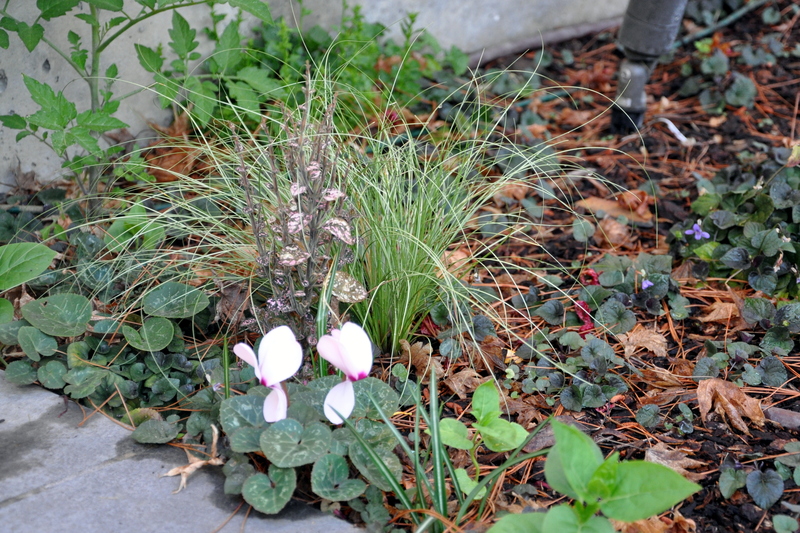 Cyclamen grow from tubers. They die back each year, returning in the winter and early spring, preferring cooler temps. This lovely pink variety is flowering like mirrored twins. This spotted pink darling self-seeded from a pot nearby. 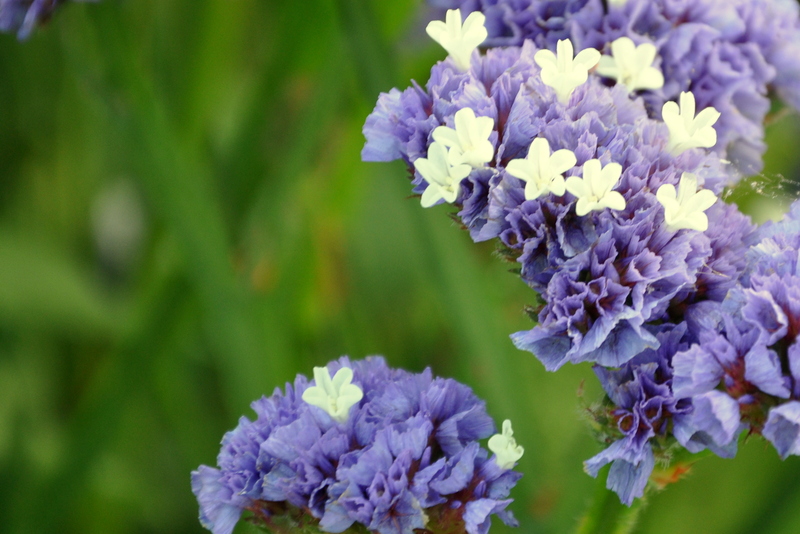 Late in the summer, tiny purple flowers appeared. It’s nice to have that splash of pink joining the others. Every garden needs some breezy grasses, right? It’s the perfect backdrop for the pinks in the foreground. Rounding out this densely populated corner is a tomato plant. Just like last year, tomatoes are popping up all over the garden. The plant is doing fine now, but once the Acer fills out for the summer, the tomato won’t receive much light. I don’t have the heart to try to move it so it stays. There are no rules that say tomatoes have to bear fruit. It can enjoy the quiet solitude of the corner and do whatever it wants. It’s day four of Blogging University. Today’s assignment is two-fold. First we’re asked to identify our ideal audience as a way of honing our blogging skills. Second, we’re to include a new-to-you element on our blog. I like challenging myself, so I’ve learned how to embed photos, YouTube videos, a contact form and a poll. Today I’m embedding a Tweet for the first time. You can learn how to embed all kinds of things on your blog via WordPress Support. I also love coaching people, so if there is something you are trying to do and can’t quite figure it out, I’m happy to help. As spring approaches, nature does most of the heavy lifting. Birds nest, even without my help and perennials come back regardless of my pruning skills. A garden, untended will not necessarily die. 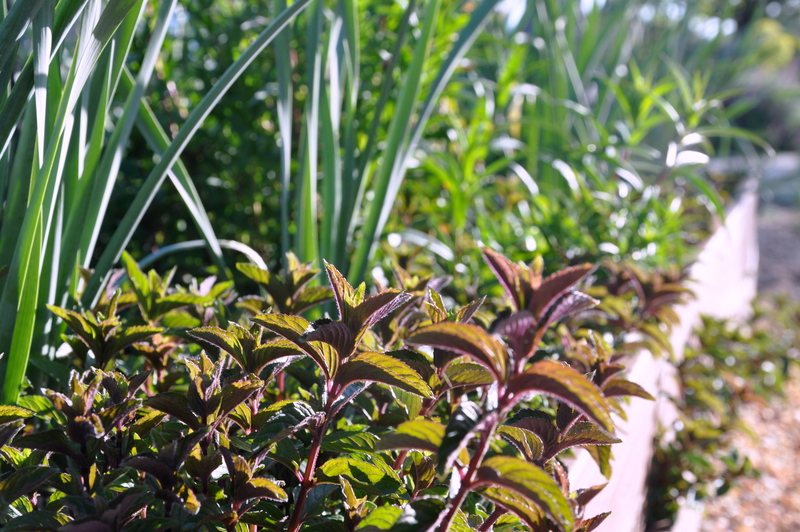 Instead the garden crosses the boundaries of the walkways, climbs the fence, winds around a tree and meanders down the block like an untended toddler. I’m having none of that. Just because Mother Nature is a well-worn cliché, doesn’t mean the parallels aren’t true. As a mom of two boys, I set limits early and often. Within those limits, the boys enjoyed free rein. 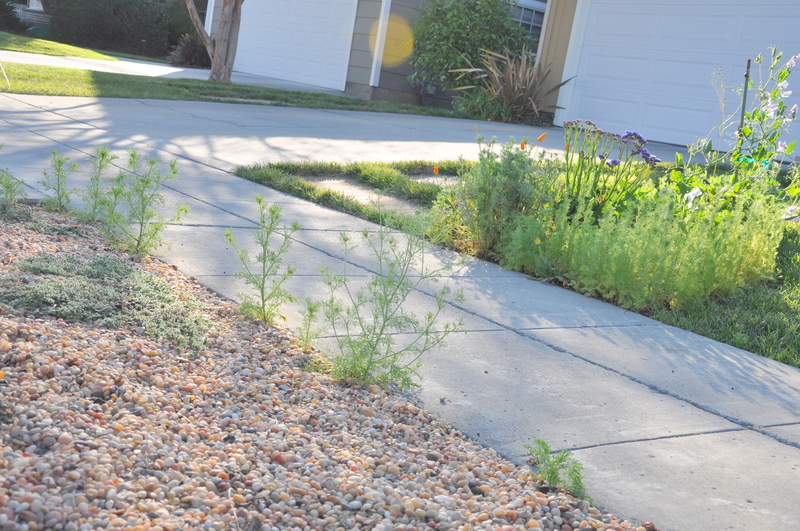 They could explore the garden, create in their sand box and run through the sprinklers (pre-drought). My youngest son loved climbing the orange tree and played for hours in the dirt. As a toddler, my oldest son licked the shiny bottom of a snail, always exploring and curious. To my chagrin, he continuously snapped green cherry tomatoes from the vine before he understood the difference between red and green. We traveled for a week and when we returned, he was able to see the difference and why they should remain on the vine awhile longer. Now teenagers, they’ve grown into well-mannered and respectful young men who understand limits but continue to soar. Those same limits fall to the garden. Well-tended branches make for happier neighbors. Overgrown weeds do not inspire trust. I might fall in love with a beautiful shrub, but if the plant’s DNA will send it skyward, then it stays on the nursery shelf. I’ve stopped planting Stock, not because I don’t like it, but because the snails eat it to the quick. Reluctantly, but with a sure hand, I’m learning to garden like the Californian I’ve become instead of longing for the English-bred garden of my roots. Some days that’s still hard, but I know it’s for the best. There are days I mother my children, days I mother the garden and days I mother myself. All three are a work in progress.